An Unhappy New Year For the S&P? The past two weeks have seen the S&P futures soar, dive, and waffle. Since the Fireball top I pointed out in early October, the S&P futures have broken below the open of the year of 2680.25 three times. Each time, it has rallied to hold above it. But I do not think it will be above it at year end. The reason I think this is that the 36 day ZGO energy forecast shown on the chart has done a very decent job of forecasting the ups and downs of the S&P over the last two months. It now shows the S&P holding up into about the 20th of December. At that time two things happen. The Fed meets December 18-19th to discuss raising interest rates. And the fall equinox falls on the 21st. The first high of the Fireball top came on the summer solstice. All forecasts should be tracked with something like exponential moving averages. In this case the 200 day EXMA is trending downward. 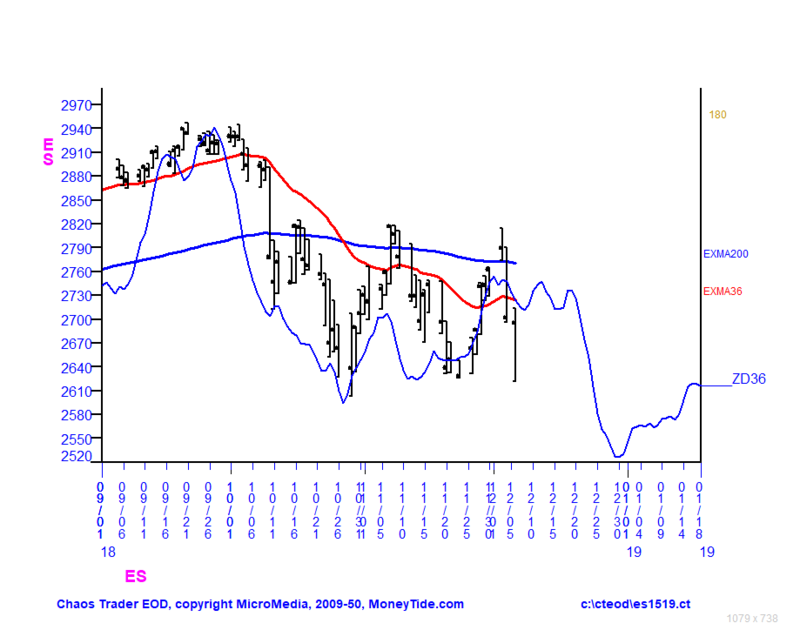 The 36 day EXMA is below the 200 day, with increasing separation. If the forecast decline into year end does occur, this separation should increase.